The FloWave facility is much more than just the test tank itself – it is also the experience and expertise of our engineers and technical staff, as well as the balance of the infrastructure that supports both the facility, the staff, and our clients. The ability to create the desired sea conditions in the facility is the result of a complex blend of novel and advanced technologies. These are in the most part beyond the expertise of the majority of users, and consequently FloWave Engineers will always work with users to both guide them in the planning and preparation of their test programmes, but also throughout the test period to ‘drive’ and operate the test tank. Above all the objective of FloWave staff is always to help ensure that test clients get the most out of the test time available in the tank. Generous space is provided for users of the facility. There is office accommodation for eight people, plus control desk positions, a separate meeting space and a small kitchen. In addition an extensively equipped workshop is being developed to allow maintenance and alterations to devices and models under test, and it is hoped that in the future this might be extended to offer a model-making capability for clients without the necessary expertise. 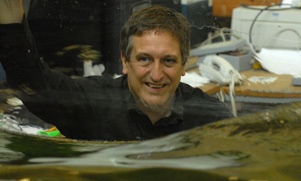 The University of Edinburgh’s Institute for Energy Systems has a long-established international reputation for marine energy research dating back to the 1970s. In the forty years since then it has continued to build on and consolidate its position at the forefront of marine energy research and innovation. Users of the facility will be ideally placed to access this IES expertise to support the various test development and evaluation projects, this regardless of whether subcontracted under FloWave, or engaged directly on a consultancy basis. Furthermore there are extensive opportunities for partnering with IES academics in collaborative research projects, and this whether on a National, EU or internationally funded basis.